Simba is our interface system for managing all the orders placed through any of the SeQura payment methods. Simba is accessible through the URL https://simba.sequra.es/session/new and we can log in typing in the suitable email and password provided by SeQura. We can find the name of our shop on the right side of the upper menu bar on the home page. When we click on it, several options will open up. Upper menu bar: It’s the green menu bar on the upper side of this screen. Search menu: It allows us to filter orders and customer sheets by typing in the data in the suitable fields. Completed orders: A complete list of the online orders in our shop made through any of the SeQura payment methods. This green menu bar located on the upper side of the interface displays several options in both right and left ends. On the left side, we can see the SeQura logo, the orders button -which gives us access to orders search-, and the reports button. The option “Orders” always gets us to the search menu, which will be explained in following lines. Clicking on the “Reports” dropdown and selecting “Payment Reports/Disbursements” we will be redirected to the disbursements page, that will be further detailed afterwards. The field displaying the searching icon is where we will be able to type in the order reference in the shop to allow the search. ​When clicking on the order, a new screen will open up showing all the customer information and the complete shopping cart registered in Simba..
By clicking on the shop’s name a new dropdown menu will show the setting options. The question mark gives access to the web of SeQura for further information. 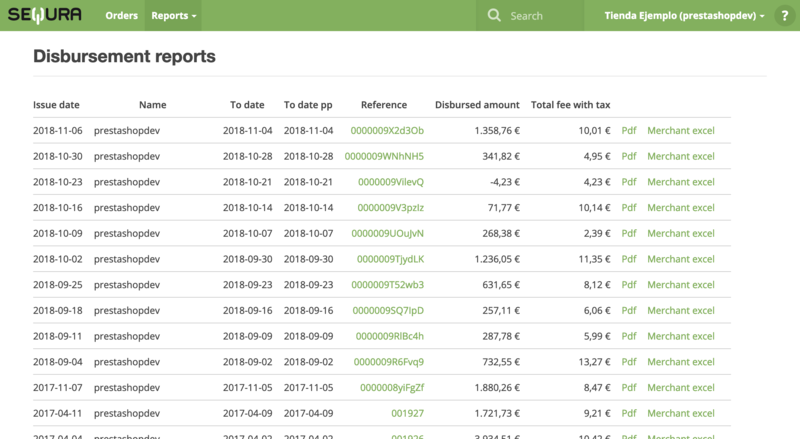 Finally, we find a list with all the completed orders, including all data such as references, dates, complete name of the consumers and status of the order. By clicking on the reference number of any order it will get us to the detailed view of the order. We can see in the image an example of an order as it will appear in Simba before being tagged as shipped. We can have this view by clicking over any of the orders from the home page or also by typing in the reference number in the upper search menu in this screen. Data appearing in this section refers to the information provided by the customer in the SeQura payment widget. It tells us some information about personal, shipping and billing information. The data we show in this section refers to the purchased products in the shopping cart. If we receive an email requesting the cancellation of the order and it has not been shipped yet, we should click on the link that will take us to the cancellation page. 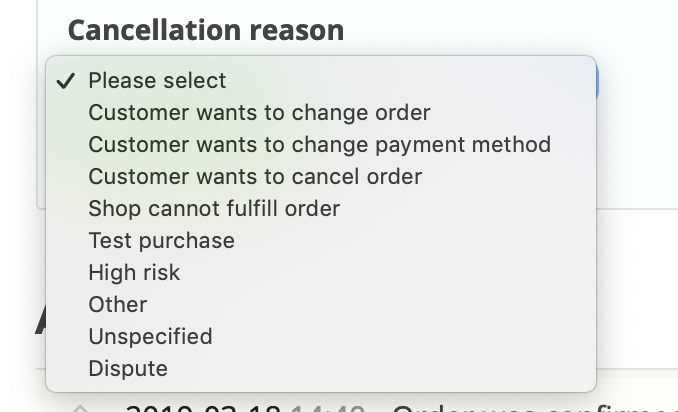 In case the client himself requests the cancellation, the shop may find the order in Simba, get into the order panel and select the Cancel option (right bottom of the image). A dropdown menu will show up and we’ll have to select one of the predefined reasons of the cancellation. We will press Cancel again and the order will get voided. Important note: An order can only be cancelled if it has not been shipped, otherwise we should remove the shopping cart content. Once the order has been tagged as shipped the data will be updated in Simba automatically. 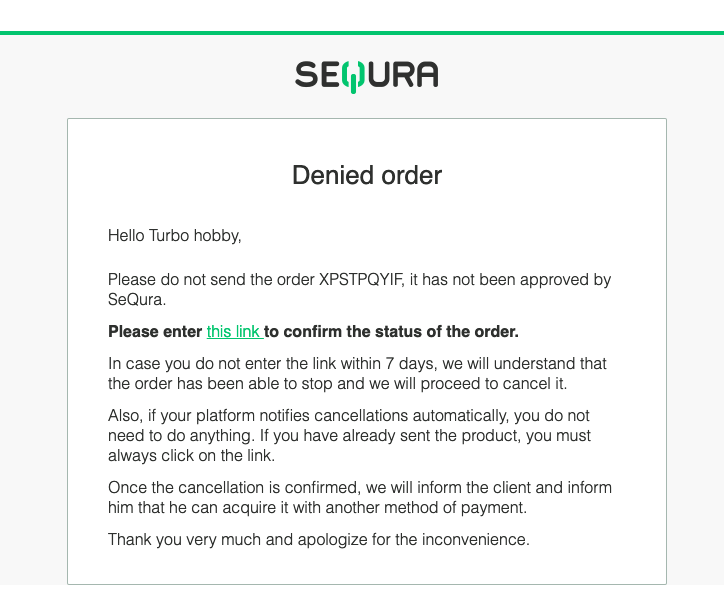 If the defined time period for order acceptance verifications has finished and you have not received any notification from SeQura, that will mean that we can proceed to the order shipping. 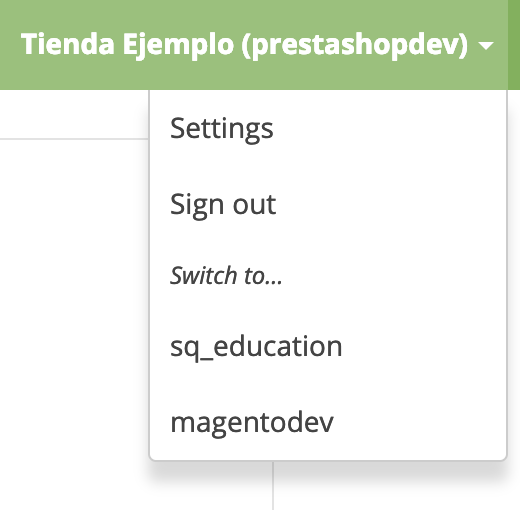 You can just tag the shipping from your own ecommerce management platform (Prestashop, Magento, etc…), once a day all the data about shippings will be updated automatically in Simba. 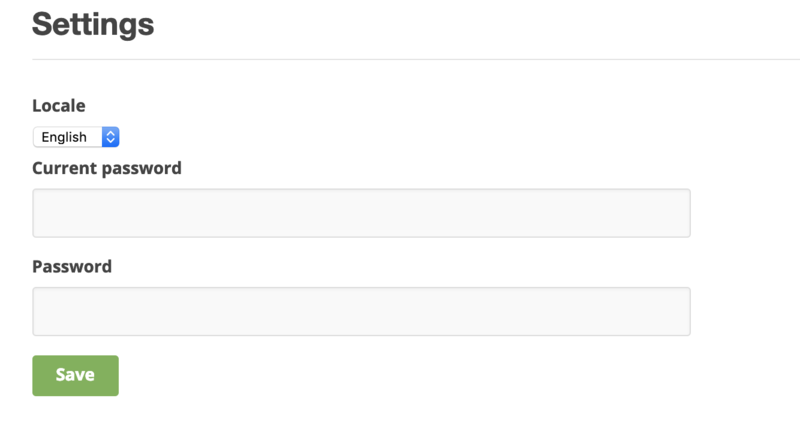 Rarely, it can happen that an order does not update properly from the ecommerce platform to Simba. In these cases, the order will have to be tagged as shipped manually. To do this, we may click on the green “Send shopping cart” button as described below. We can resend the instructions for the payment to a customer in case they have been not received the first time. By just clicking on "Send" a new email with the instructions will be sent to the email address provided by the shopper. It is possible to visualize the attached file that will be sent in the email by clicking on "View". To modify an order, we can click on the green text “Edit cart” we can see below. The reasons for editing an order can be for example the partial or total return of the products, the application of vouchers or any discount, or even the late inclusion of administration fees. 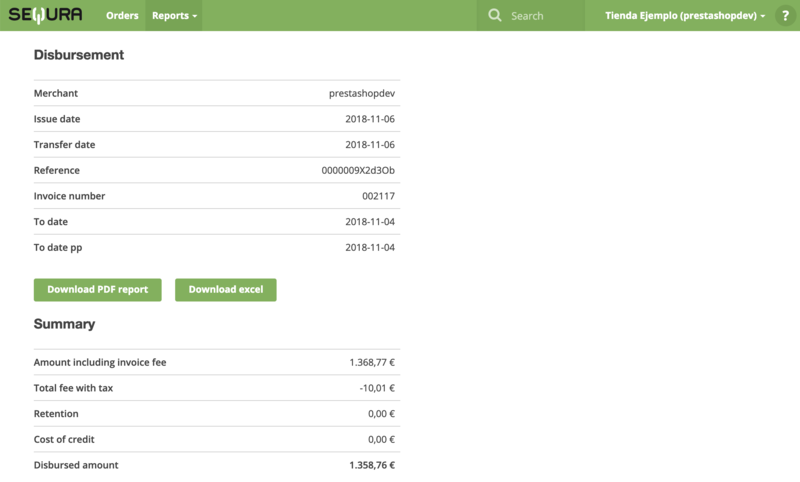 Immediately, the different fields will become editable: reference number, name, prices, quantity and totals. The options Add product, Add shipping fees, Apply discount or Apply voucher are all beneath the form fields, and they allow us to do some useful managing tasks. Once we have completed the appropriate changes in the order, we will click on the green button Update and the data will be automatically updated in Simba. When changes in the order have been completed, it is appropriate to also notify the changes to the customer. To send this payment information to the customer, we will click on the button Send and Simba will send a notification email with all the updated information. 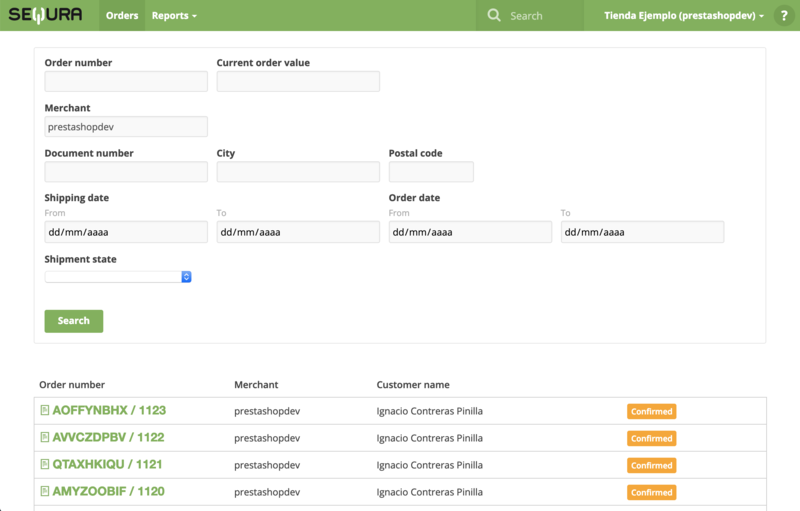 On the lower side of the orders panel we will always find the Activity log, in which we will have registered every change and edit made over an order, and who has made them, so we can track every movement related to a specific order. 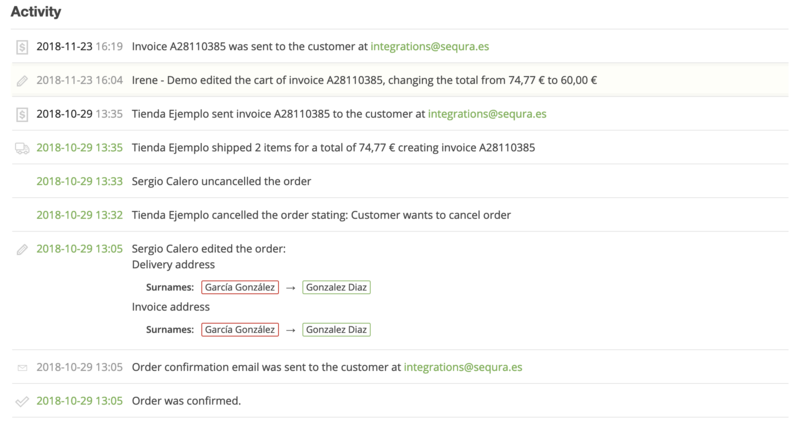 It is also possible to view previous versions of the orders, to have all the control over changes, refunds or cancellations, by clicking on the button Previous version, which is displayed on the upper right side of the order panel. From the upper menu we click on the option Reports, and then the Payment Report will show up, giving us access to the numeric sheets of the weekly disbursement. 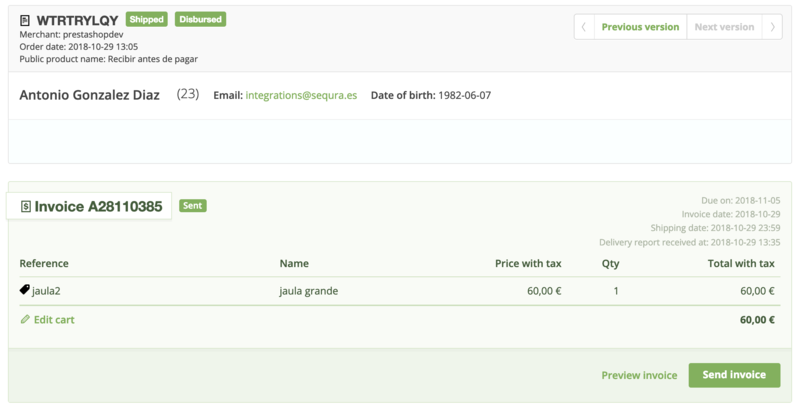 Every time SeQura makes a new payment, the shop will receive a notification email advising the availability of the report. Issue date: date in which the payment is issued. Name: name of the beneficiary shop. To date: this indicator tells us if the orders tagged as shipped and completed through the “Try first, pay later” option have been paid. To date Part Payment: it tells us if the orders tagged as shipped and completed through the “Try first, pay later” option have been paid. Reference: reference number of the generated invoice. Disbursement amount: total amount paid to the shop by SeQura. Total fee with tax: total amount of the sum of the fees charged to the shop by SeQura. PDF: it downloads the invoice and the payment report. XLS: it downloads as a sheet the breakdown of every amount of the orders included in the PDF. If we click on the invoice reference number, we can get a detailed view of the content of that disbursement.